Marcelle never disappoints us with their colour collections and their spring collection is no exception. If you love Dior spring but don't have that kind of cash you will be thrilled with this one! 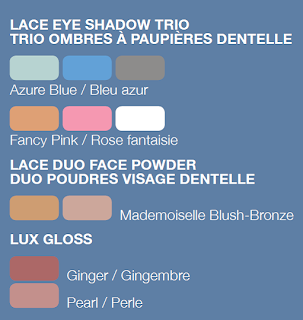 And of course Marcelle colours always have great pigmentation and excellent staying power - I haven't seen this collection in person yet but I am keeping an eye out and looking forward to getting my hands on it, especially the blue eye trio! I bought these and I am loving the gloss especially ginger- such a pretty wearable colour that really makes your whole face prettier. The blue palette is light and slightly frosty so you can apply to your hearts content without going overboard. The blush/bronze is the most subtle blush/bronzer I have ever used. You could apply it for 1/2 an hour straight and it still doesn't show up on your cheeks. It acts more like foundation coverage than a blush but I think that it's subtle sheen is a good match with the light blue eye colours.